Taipan Arron Logan inserted the datachip into the reader slot that had silently opened on his previously featureless desk. He turned to face the large holoprojector set into a corner of his spacious office. The light dimmed as the windows autopolarized to filter out the rays of the sun. The report was brief and to the point. The short film of orbital workers unloading shuttles and securing the supplies within the holds of a Southern long range ship matched the description he had received from his agent at the Port Oasis spaceport. He pondered the information for a moment. The shadowy figure had remained perfectly silent and still up to now, barely noticeable in a dark suit of conservative cut. Logan turned to face him. "Ensure that the next launch encounters an... incident." He smiled slightly. "Then let it be known that we have an opening in the schedule of our own factory." After all, he thought, why be satisfied with just the planet when one could sell to the whole system? 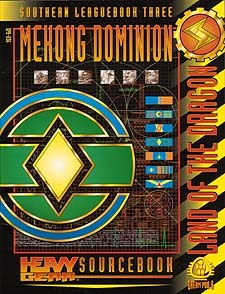 While the majority of the planet is bracing itself for what seems like an inevitable conflict, the Mekong Dominion is already engaging in all out warfare. Merchant princes send forth their delegations deep within the Dominion's neighbours, entrenching themselves in the financial heartland of both enemies and allies. Deceit and trickery are seen simply as the cost of doing business. While the rest of the planet steels for the coming battles, the Dominion is making itself wealthy.